My father after he kissed the flag. We were able to video the visit as Chief Petty Officer Bustos presented him with the U.S. flag and thanked him on behalf of the President of the United States for his 22 yrs. of service…If we had never had the talk and many conversations about what was important to him, this wish would never have been realized. On June 26,2012 my dad was diagnosed with metastatic cancer and was given less than 3 months to live. My sister and our spouses immediately went to him for support until our two brothers could fly in from other states. We are so very thankful for the time that we had with him during his dying process on hospice. We talked about many things and mostly listened to what was important to him and to the things that mattered most. He was very concerned about being a burden to his family. We had a hospice nurse come in on the day of diagnosis to help us and him understand what the days ahead might hold. He was very relieved to know that they would help him with his personal care and comfort when the time came. We are so thankful to hospice for allowing us to be his daughters and sons and let them be the caregivers. One thing that we learned from our many conversations with our father was that he was very proud and honored to have served his country as Chief Petty Officer in the Coast Guard for 22 years. He spoke of his military service in almost every conversation. I had no idea how to do it but I wanted him to know before he died that his military service was not only important to us but to the Coast Guard as well. I searched on the internet for Coast Guard leadership and found several leader’s email address. I emailed four of the leaders that I found online with his story and I ask if someone from the Coast Guard could possibly come to his home and honor him by officially relieving him of his duty from the U.S. Coast Guard. I didn’t expect a reply and with time not on our side I was very surprised when I received an email within a few days from Chief Petty Officer Bustos in Ft. Worth Texas that said he would be honored to pay my father a visit. We were able to video the visit as Chief Petty Officer Bustos presented him with the U.S. flag and thanked him on behalf of the President of the United States for his 22 yrs. of service. As the Chief Petty Officer reached out to shake my fathers hand, my father embraced him instead with a hug and tears. As Chief Petty Officer Bustos was leaving, he saluted my father and in my father’s weakened state he managed to get his hand up to his brow and return the salute. 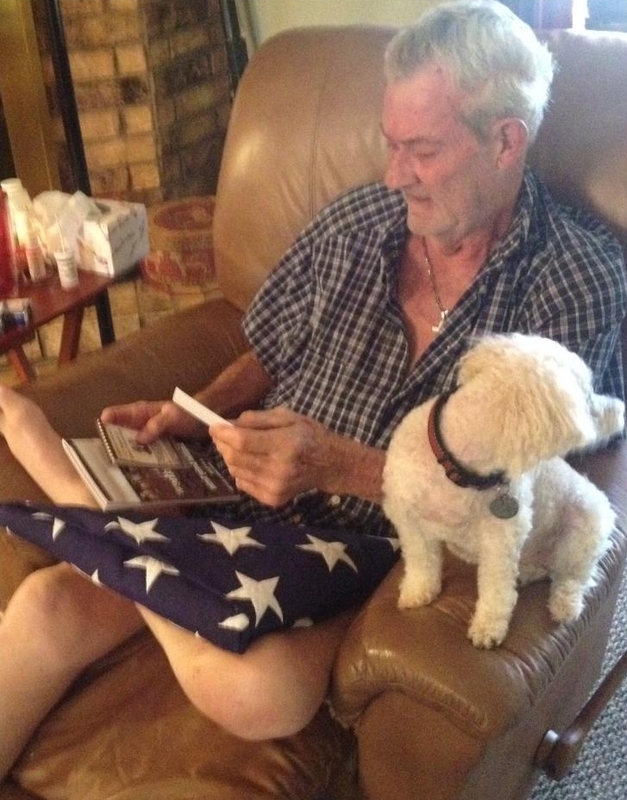 My father started to cry and reached down to his lap, raised the U.S. flag and kissed it. It was at this moment, that of all the things I could have done to honor my father’s wishes, this was it. Again all of this was on video and my father asked to see the video two days before he died. I sat my laptop on his chest in his hospital bed and i held tissue to his eyes as he watched again and cried because of the honor that was bestowed upon him. If we had never had the talk and many conversations about what was important to him, this wish would never have been realized. My father passed on August 15, 2012 and the video was played again at his funeral. We are so thankful for the talk and for hospice to help guide us through a time that will forever be special to all of us.